Whenever I want to make some soup for dinner, Nami doesn’t want to have any of the creamy smooth type of soups. She prefers the wholesome, full of vegetable types and so had to hunt for recipes to fit that category. Some with lentils are perhaps like making dal without the masala. But, I have got to share this recipe with you as the soup was delicious, wholesome and satisfying. Heat oil in a saucepan over medium heat. Add onions and cook till they are slightly soft. Add sweet pepper and zucchini. Stir fry for 2 to 3 minutes. Add the chopped tomato, beans and corn. Mix well. Add tomato puree, salt, chilli sauce and water or stock. 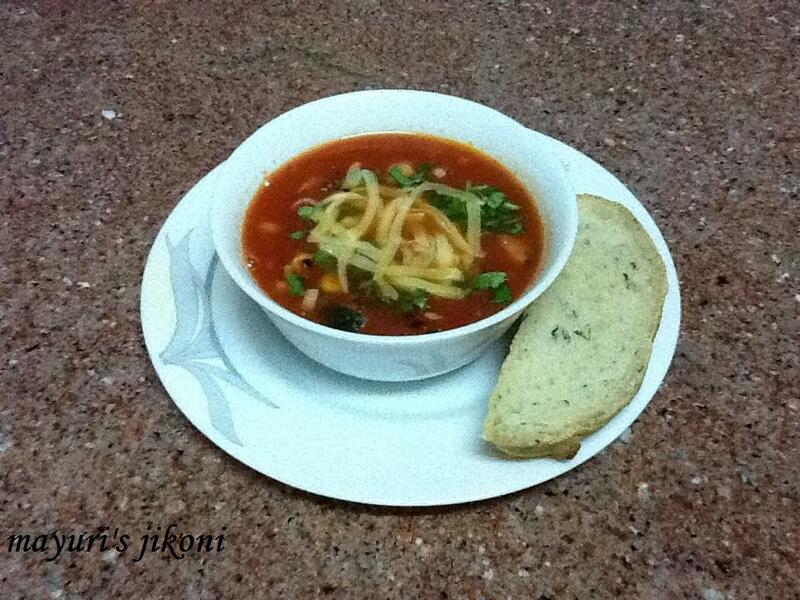 Let the soup simmer over low heat till the vegetables are cooked. Do not bring to a rolling boil. Add pepper and coriander. Mix well. Spoon the soup into serving bowls and sprinkle grated cheese on top and serve. Use other vegetables like carrots, mushrooms,etc. I used my home made red chilli sauce. You can use any. Use fresh tomato puree. For home made puree check out the recipe for dal makhani and go to the tip section. Adjust the amount of salt according to your taste. I had put some salt while cooking the beans and corn. Can use any beans of your choice like white beans, black beans, fagioli etc. I hope we get to see you soon and i won't stop you from making anything out of the blog for me!